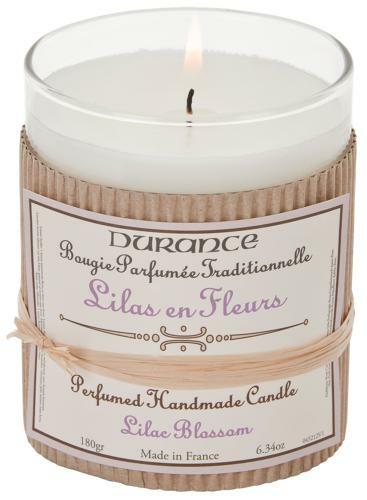 LILAC BLOSSOM SCENTED CANDLE - Perfume your home with a springtime scent tinged with innocence, both green and flowery. Wax perfumed with genuine fragrance from Grasse, Provence. Wick 100% cotton: allow the candle to burn for a minimum of 1 hour and away from draughts to ensure the scent is dispersed and allow the surface to melt thereby allowing the candle to burn evenly all the way down. Warning: Keep the naked flame away from combustible and flammable materials (curtains, tablecloths, net curtains, furniture and clothing). Do not place on a hot surface or a surface that can absorb heat. Never leave a lighted candle untattended. Do not leave within the reach of children. Do not move candles when lit or when the wax is liquid. Never leave matches or wick on a hot candles as it could catch fire. Never burn candles too near a wall, in draughts or near radiators.